Prominent & Leading Manufacturer from Ahmedabad, we offer cyclone air pollution control equipment, water scrubber, cyclone dust collector, multi cyclone dust collector, pollution control cyclones and electrostatic precipitators. 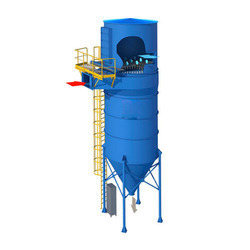 Cyclone Air Pollution Control Equipment are cylindrical chambers with a means of producing spiral flow at the top and a dustbin at the bottom. These are primary collectors. Cyclones are useful for all processes such as gas cleaning, de-dusting, product recovery, pneumatic conveying etc. 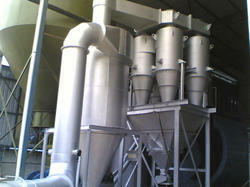 Cyclone with a pulse jet bag filter will offer long life to the bags and maximum efficiency of collection. Cyclones are classified as per the arrangement and number of shells.The unique helical cover high-efficiency cyclonic collectors will separate dust particles from the air stream with the impact of centrifugal force. Cyclones are designed for any capacity starts from 500m3/hr. Twin and quadruple arrangements are suggested to accommodate the size for bigger capacities from 25,000m3/hr. onwards. 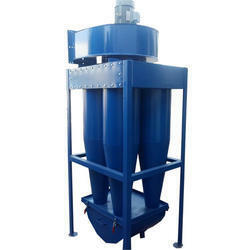 We are offering Water Scrubber to our clients. 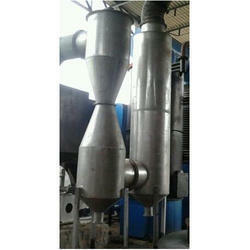 We are offering Cyclone Dust Collector to our clients. The multi-tube shop-assembled Dust collector Balkrishna consists of a housing containing a number of collection tubes, each of which is, in fact, a centrifugal dust collector. The dust laden gas entering the dirty air plenum moves downwards into the collecting tube, being guided by a helical veined annular ring. These vanes impart a smooth spiral movement to the gas, setting up a high centrifugal action. As the gas descends in a cyclonic pattern, the dust is thrown outwards and is discharged through peripheral slots in a shave-off boot. A vortex is formed at the bottom of the centrifugal tube and the clean gas forms an inner whirl which ascends vertically into a discharge (outlet) tube, and then collectively out of the unit through the outlet plenum. All the collectors are completely assembled to the extent practical for shipment, resulting in minimum erection man-hours and handling at the installation site. 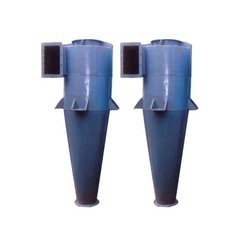 Pollution Control Cyclones are cylindrical chambers with a means of producing spiral flow at the top and a dust bin at the bottom. These are primary collectors. Cyclones are useful for all processes such as gas cleaning, de-dusting, product recovery, pneumatic conveying etc. Gas Volume 5,000 m3/hr to 1, 00,000 m3/hr. 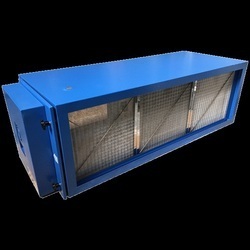 An electrostatic precipitator is air pollution control device used to separate solid particulate matter from a contaminated air stream. Contaminated air flows into an ESP chamber and is ionized by electron emitting electrodes also known as the corona chamber. The suspended particles are charged by the electron field and migrate to a collection plate. Accumulate particulate matter is removed from the collection plates at periodic intervals by rapping or hitting the plates with rappers (mallets type hammers). Heavy particles fall to the base of the ESP where hoppers hold the removed particles for disposal. The process involves charging of the particles by bombarding them with electrons emitted from discharge electrodes. 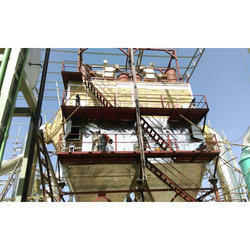 We are recognized as a rich entity, engaged in offering a wide assortment of Dry Electrostatic Precipitator. An Electrostatic Precipitator works on the principle of charging the gas using high tension static current generated by TR set. 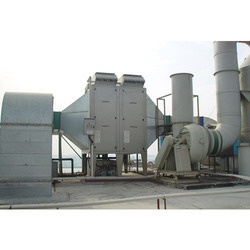 An Electrostatic Precipitator is air pollution control device used to separate solid particulate matter from a contaminated air stream. Contaminated air flows into an ESP chamber and is ionized by electron emitting electrodes also known as the corona chamber. The suspended particles are charged by the electron field and migrate to a collection plate. Accumulate particulate matter is removed from the collection plates at periodic intervals by rapping or hitting the plates with rappers (mallets type hammers). Heavy particles fall to the base of the ESP where hoppers hold the removed particles for disposal. There are typically three types of ESP units dry negative corona units, wet negative corona units and wet positive corona units. Dry negative corona units have inherently better voltage/current characteristics are utilized more frequently and will be the main focus of this website however, wet negative corona units will be discussed for their applicative differences. Air Pollution Control System is air pollution control device used to separate solid particulate matter from a contaminated air stream. Contaminated air flows into an ESP chamber and is ionized by electron emitting electrodes; also known as the corona chamber.